Plaintiff's motion for an ongoing royalty for post-judgment sales was granted and the court awarded a rate of $14.50 for each accused sale which was enhanced 33% from the jury's rate of $11 to account for willful infringement. "There was evidence at trial that [defendants] obtained and relied upon an opinion of counsel that they did not infringe the patents-in-suit and that the patents-in-suit were not valid. While this would be relevant to [their] culpability with respect to pre-verdict infringement, it carries little to no weight with respect to ongoing post-judgment infringement now that a jury has found that [defendants] do infringe and has failed to find that any of the asserted claims are invalid." Defendants' motions to dismiss plaintiff's qui tam false marking action for violating the Take Care clause of the Constitution was denied. "In this Court’s view, the fact that section 292 is a criminal statute does not make a qui tam suit under section 292(b) 'a criminal action.' Indeed, if it was, the Rules of Civil Procedure would not even apply – including Rule 9(b), which the Federal Circuit specifically held in BP Lubricants USA [(Fed. Cir. Mar. 15, 2011)] applies in false marking cases. In this Court’s view, the better view of the false marking statute is that it is a criminal statute with a parallel civil enforcement mechanism." Defendant's alternative motion to transfer venue was granted. "[T]he only allegedly local interest in the present case is that [defendant's] online trading platform . . . is accessible to customers worldwide, including customers in the Eastern District of Texas. . . . In contrast, the Northern District of Illinois has a particularized interest in the resolution of this case. [Defendant] is a resident of Illinois and is headquartered in Chicago. Additionally, the alleged acts of infringement involve the access to NADEX through [its] Pure Deal trading system that is administered from Chicago Illinois. . . . Considering all of the private and public interest factors, the defendants have met their burden of showing that the Northern District of Illinois is 'clearly more convenient' than the Eastern District of Texas." The magistrate judge recommended that default be entered against one counterclaim defendant and that the burden of proof on secondary considerations be switched against the remaining affiliated counterclaim defendant if discovery was not produced in 20 days. "[A]lthough [the remaining defendant] contends that it cannot compel [the defaulting defendant] to produce ordered documents, the willful non-disclosure on the part of [the defaulting defendant] benefits [the remaining defendant] directly by ensuring that [counterclaim plaintiff] does not obtain documents which could enable it to establish its defenses." The court granted in part defendant's motion to dismiss plaintiff's qui tam false marking action for failure to state a claim, but rejected defendant's constitutional challenge to 35 U.S.C. § 292. "The Court finds that Section 292 is constitutional because, among other reasons, 'the Executive Branch is not without the ability to assert its interests in a [Section 292] qui tam action.'. . . This Court distinguishes Unique Product Solutions, Ltd. v. Hy-Grade Valve, Inc. [(N.D. Ohio Feb. 23, 2011)], where the district court described the False Marking Statute as a 'wholesale delegation of criminal law enforcement power to private entities.' This Court is of the view that Section 292 is 'civil in form, even though it arises under a criminal statute.'" Courts Warn Against "Bickering" and "Sniping"
In denying Defendant's motion in limine to exclude evidence concerning pre-production versions of its product, the court "remind[ed] the parties to avoid tendentious bickering. . . . There must be no more of this childish abuse ('akin to a robber,' etc.). [Defendant] is at fault too but the plaintiffs are even worse offenders. No more or there will be sanctions. In more than 29 years as a judge, I have never encountered such bickering, quarrelsome lawyers. You are wasting my time and your clients’ money." The Chamberlain Group, Inc., et. al. v. Lear Corporation, et. al., 1-05-cv-03449 (ILND March 22, 2011, Order) (Posner, C.J.). In denying defendant's motion for a protective order, the court opined that "[t]hese motions are far more about lawyers litigating than about resolving disputes - and the Courts are for resolving disputes - not 'sniping' not 'gamesmanship' and not billing files. . . ."
Azimuth Unlimited, LLC v. Seatel, Inc., 0-10-cv-60253 (FLSD March 22, 2011, Order) (Brown, M.J.). The court denied defendants' motion to dismiss plaintiff's qui tam false marking action for violating the Appointments Clause and the Take Care Clause of the U.S. Constitution. "[D]efendants have failed to persuade the court that unless a qui tam action provides specific provisions permitting substantial control by the government, the statute is unconstitutional under Article II's 'Take Care' Clause. . . . [W]hile § 292 is nominally a criminal statute, the punishment for violating the statute is merely a civil fine. . . . Accordingly, the court does not agree that the statute can reasonably be characterized as invoking the executive's core function of criminal prosecution." With respect to the Appointments Clause, the court reasoned: "There is simply no evidence that [plaintiff's] -- or any other entity's -- use of § 292(b)'s qui tam provision makes it an 'officer' of the United States government. . . . [P]laintiff is acting as nothing more than the assignee of the government's claim for false patent markings. Defendants have provided nothing to even suggest that plaintiff, as an assignee, is an officer of the United States as the term is used in Article II." The court denied defendant's motion to dismiss for failure to state a claim and observed that Rule 11 applies to frivolous motions to dismiss as well as frivolous lawsuits. "[T]he complaint actually names one example infringing product. By naming at least one product, the complaint pleads more than what is required under the law. Additionally, as noted above, there is no requirement that the complaint specify which specific claims the plaintiff is asserting — despite [defendant's] statements otherwise. . . . [N]ot much is required to satisfy the pleading standards for patent infringement under Federal Circuit caselaw and . . . Form 18. Nevertheless, based on this Court's judicial experience, Rule 12(b)(6) motions are seemingly filed as a matter of course in patent infringement lawsuits in this Court. . . . The Court finds it appropriate, given the questionable arguments in [defendant's] motion and [its] heavy reliance on Rule 11, to remind and caution the parties that Rule 11 cuts both ways and that Rule 11 also applies to frivolous motions. The Court holds, however, that [defendant's] current motion does not warrant Rule 11 sanctions." The court granted defendants' request for early claim construction of three terms in a consolidated case with over 100 defendants. "Plaintiff’s strategy in this case . . . makes it unlike the typical patent case. Plaintiff has sued over 100 Defendants with the goal of early resolution of the disputes through settlement in a range that essentially amounts to litigation costs. In this case, the Patent Rules and the Court’s standard docket control order—including early production of extensive electronic discovery—make defending the case almost cost prohibitive. . . . Plaintiff’s strategy presents Defendants with a Hobson’s choice: spend more than the settlement range on discovery, or settle for what amounts to cost of defense, regardless of whether a Defendant believes it has a legitimate defense. Because the Patent Rules and the Court’s standard docket control order do not achieve their intended result in this particular case, it is necessary to depart from them in an effort to accomplish both parties’ objectives in the most cost effective manner. . . . Defendants believe there are three claim terms that affect all Defendants which, if construed, would be case dispositive. . . . Construction of these limited terms early in the case will resolve several important issues at a beneficial time for each party to better evaluate its case." The court granted plaintiffs' motion to strike defendants' answer as a Rule 37 sanction for newly discovered suppression of evidence. "[T]he Court notes that Defendants have already been found to have lost, destroyed, or withheld material documents, including invoices, purchase orders and emails. . . . In addition . . . the Court granted Defendants leave to have [a witness] appear at deposition . . . by videoconference based on Defense counsel’s representation that 'it appears impossible to obtain the necessary paperwork to bring him to Seattle at this time.'. . . However, [the witness later] testified under oath that he had made no efforts to travel to the United States for his deposition, had within his possession a five-year visa, and could travel to the United States at any time. . . . [T]he Court has already imposed the sanction of an adverse instruction. Apparently, this has done little to promote respect for the integrity of the discovery process. Furthermore, it is unclear how an adverse instruction would now alleviate the damage that has been caused by Defendants’ continued failure to cooperate with Plaintiffs in discovery." Following a bench trial and claim construction the court determined that defendants' ANDA for a generic version of Fentora® did not infringe the patents-in-suit. "Regardless of how the ANDA product may be working, the only proffered evidence that the ANDA product actually results in an increase in the rate and/or extent of absorption across the oral mucosa is the fact that the ANDA product is 'bioequivalent' to Fentora®. . . . [T]he inquiry is not identicality to Fentora®, it is whether the ANDA product meets the limitations of the asserted . . . patent claims." The court granted the U.S. government's motion to reconsider its earlier ruling that 35 U.S.C. §292 violated the Take Care Clause but the court reaffirmed its earlier decision. "[T]he government claims the Court erroneously relied upon the sufficient control analysis utilized in Morrison v. Olson, 487 U.S. 654 (1988), because a False Marking qui tam relator is not an inferior officer of the government, but rather, is an assignee of a revocable interest of the United States. The government’s argument for reconsideration is premised upon its belief that the Court incorrectly characterized the False Marking Statute as criminal rather than civil. . . . [E]ven if the False Marking Statute is considered to be civil or a civil-criminal hybrid governed by the Federal Rules of Civil Procedure, the Court would still find the statute unconstitutional under the Morrison sufficient control analysis. . . . [T]he Court believes that, because it must follow the Sixth Circuit’s application of the Morrison analysis to the non-patent False Claims Act, consistency requires the Morrison analysis to apply to the False Marking Statute, as well." Defendant's motion for summary judgment on plaintiff's false marking claim was granted where defendant acquired the accused product line from a third party who previously marked the products with the subject patents and where defendant immediately segregated its inventory after learning of the false marking. "[T]here is no evidence that anyone employed by defendant -- either within or outside of [defendant's product manager's] team -- was aware that the [accused product] packaging was marked with expired or inapplicable patents. Instead, the evidence reveals that the employees responsible for reviewing the packaging took for granted that the patent markings were appropriate, and that no one outside that team verified that the information was indeed accurate. . . . On this record, no reasonable jury could conclude that defendant specifically intended to deceive the public with false patent markings." Where plaintiff accused manufacturers of flame retardant fabric and customers who incorporated the fabric into garments of infringing, the court denied plaintiffs’ motion to compel the production of "data regarding the customers’ sales figures, costs, and profits stemming from their sale or rental of garments incorporating the allegedly infringing fabric." "The plaintiffs assert that because they ‘intend to seek lost profits from [fabric manufacturers] . . . for a portion of their sales’ to the customers, the detailed financial data regarding the customers’ infringing sales are therefore ‘relevant to damages issues.’. . . But here, the plaintiffs -- who make and produce fabrics, not garments -- do not suggest that they would have made sales of garments, rather than fabrics, absent the alleged infringement. Nor have they explained in what way the downstream sales information regarding finished garments would influence their calculation of lost sales of fabrics when the manufacturer defendants have already provided them with fabric sales information." Moreover "plaintiffs have not articulated any specific potential theory under which they could factor the sales of finished garments, rather than fabrics, into the reasonable royalty base of a hypothetical negotiation with the manufacturers." The court denied defendants' motion for Rule 11 sanctions and rejected the argument that plaintiff's "settlements with other defendants for less than the cost of defending the case is evidence that [plaintiff's] infringement theory was frivolous." "In some situations, a plaintiff asserting a large damages model while making very low offers of settlement early in the case may indicate that the plaintiff realizes its case is very weak or even frivolous. While the numbers cannot be determinative, they may be indicative of the good-faith nature with which the case is brought. Defendants contend that at least one of the settling defendants sells billions of dollars of products yet settled for less than one million dollars, but [plaintiff] points out that its accused products were an extremely small portion of its business. [Plaintiff] described its damages model to the Court, which was not large for a patent case. Given that description, the earlier settlements were not so unreasonable as to indicate that [plaintiff] believed its case was weak or frivolous. . . . [T]his Court has some concerns about plaintiffs who file cases with extremely weak infringement positions in order to settle for less than the cost of defense and have no intention of taking the case to trial. . . . In contrast, there may be legitimate cases where a plaintiff settles with a few smaller defendants in an effort to raise needed capital in order to proceed to trial against the remaining major defendants. In those situations, plaintiffs typically settle with smaller defendants and proceed to trial against larger defendants who have larger damage potential. Such is a legitimate trial strategy. Moreover, the Court does not want to discourage early settlement of some or all defendants." The court denied defendant's motion to dismiss plaintiff's qui tam false marking action for failure to state a claim, because allegations that defendant previously conducted due diligence activities with respect to the patents gave rise to an inference of intent to deceive. "Plaintiff has alleged a chain of assignments concerning the now-expired patents . . . before being ultimately assigned to [defendant]. This chain of assignments supports Plaintiffs assertion, based upon information and belief, that [defendant] performed due diligence on the patents it was acquiring, which would have given it a working knowledge of the expiration dates and scopes of the patents. Plaintiff further alleges that [defendant] has been accused of infringing patents . . . pertaining to [the falsely marked products]. This allegation also supports Plaintiffs assertion, based upon information and belief, that Plaintiff studied the features of its [products] in response to the litigation and knew or should have known that its products were not covered by [one of the patents-in-suit]. . . . Plaintiff asserts that [defendant] used two of the three . . . patents identified in the pleadings as collateral to secure a loan . . . . [T]he fact that [defendant] used these patents for loan collateral supports Plaintiffs assertion, made upon information and belief, that [defendant] knew or should have known the expiration dates of the relevant patents." Brinkmeier v. Graco Children's Products Inc., 1-09-cv-00262 (DED March 7, 2011, Order) (Stark, M.J.). The court denied defendant's motion to dismiss plaintiff's earlier-filed declaratory relief action for lack of subject matter jurisdiction where the declaratory relief action was filed on the day the patent issued, but before the PTO website reported such issuance. "Neither party has presented the Court with legal authority addressing this precise question, and the Court is aware of none. . . . Unlike the electronic filing systems utilized by federal courts, neither the PTO websites nor the patent itself displays the time a patent was issued. Without such concrete data, parties would have to rely on affidavits stating the time the PTO website first showed the patent had issued. 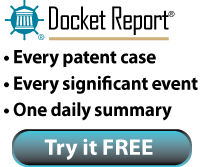 Thus, it seems that under [defendant's] approach, the race to the courthouse would be preceded by a race to first observe a patent’s issuance on the PTO website. . . . [T]he Court is persuaded that [plaintiff's] approach is correct and holds that the [patent-in-suit] was issued just after 12:00 a.m. EDT on July 6, 2010, and thus [plaintiff's] Complaint was filed after the Patent issued." In granting defendant's motion for summary judgment of no indirect infringement, the court found that "even after extensive discovery - comprising over 7 million pages of documents, 40 depositions, and 55 subpoenas to [defendant's] customers - [plaintiff] has failed to present even a single instance of a customer using the [accused] products in an allegedly infringing manner. . . . [Plaintiff] has not cited a single document in which [defendant] instructs its customers to implement the exact scenarios that [plaintiff] contends infringe the [patents-in-suit], all of which require a specific combination and configuration of products, supported by particular hardware and other specified elements, before they are even capable of infringing." Following a bench trial, the court found that plaintiff had engaged in false marking where it advertised that its fish products were produced in accordance with a patent to which plaintiff had a license, but where plaintiff did not follow the method described by that patent. "[Plaintiff] was aware that these advertisements were false in, at least one way: [plaintiff] never pre-cooled the [filtered wood] smoke down to 0º to 5º C before applying it to the tuna to be treated with [filtered wood smoke], as required by the [patent-in-suit]." Is the Claim Term "At Least About" Indefinite? Defendants' motion for summary judgment of indefiniteness of two of plaintiffs' patents-in-suit was granted. "[W]e agree with [defendants] that 'at least about' does not sufficiently inform the public on what would infringe. . . . There is simply no intrinsic evidence that the word 'about' coupled with 'at least' has an accepted meaning." Plaintiffs' motion for attorneys' fees was granted and the court awarded fees of more than $2.6 million. "The case required an inordinate amount of time and labor based on extensive motion practice and discovery difficulties encountered during the course of the litigation, most of which were initiated or caused by the Defendant. The questions at issue, although artfully distilled and presented at trial, were complex and layered, requiring the analysis and understanding not only of the specific patent at issue, but of earlier related patents and patent application procedures as well. To understand, simplify, and distill the information and present it to the jury in an understandable and persuasive manner involved an extremely high level of skill. Plaintiffs' lawyers did exceptional work in this case, and achieved the best possible outcome for their clients. . . . Although the damage amounts in this case were not extensive, the $300,000 in actual damages pales against the value of an enforceable permanent injunction that will prevent [defendant] from continuing its established practice of infringement . . . ."
In granting plaintiff's motion for a permanent injunction, the court found that defendant's infringing products competed with plaintiff's licensees and therefore irreparably harmed plaintiff. "While [the parties] are not direct competitors, the record establishes that [defendant's] Infringing Systems are in direct competition with [plaintiff's] licensees and that [defendant's] use of the infringing products interferes with [plaintiff's] licensing opportunities. . . . [Plaintiff] pursued a number of different commercial activities with the relevant patent portfolio including endeavoring to manufacture the patented equipment, soliciting purchase offers for the patents, granting licenses to some entities, and declining to grant licenses to others. In light of the range of commercial activities [plaintiff] has engaged in with the Patents-In-Suit, the Court finds the present case to be factually distinguishable from those cases where the patentee routinely grants boilerplate licenses to any interested parties to such an extent that permitting a licensed infringer to remain on the market would not irreparably harm the patentee." Defendants' post-trial motion for attorneys' fees under Section 285 was denied. "[Defendant's] theory is that [plaintiff] should be liable for attorneys' fees because it ultimately lost its infringement claim against [defendant] at trial. . . . [B]ecause [plaintiffs'] action survived summary judgment, it is appropriate to conclude that it was not objectively baseless, and thus, not exceptional for purposes of awarding attorneys' fees."